After last weeks post on extracting elements out of a list by minimum or maximum keys Ody Mbegbu mentioned on Google+ how he feels that something LINQ is missing is the functionality to batch, page, or divide a sequence into sub-sequences of a given size. That is what we are going to look at today! We will take this method as a starting point, and explore if and how it can be improved. 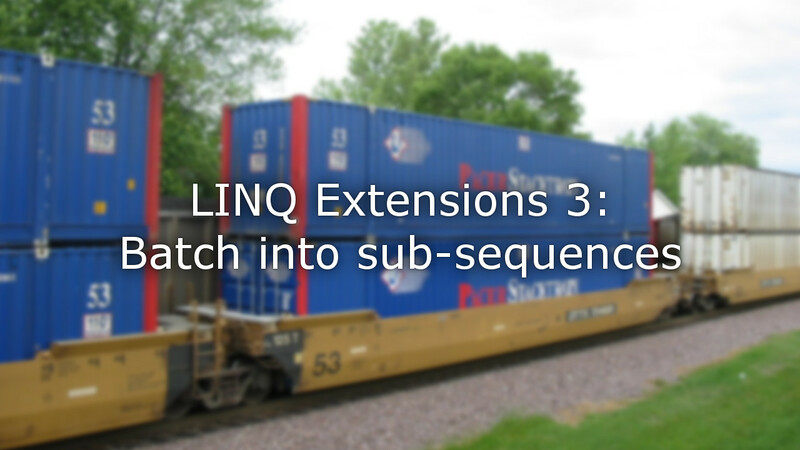 Note: Check here for more posts on extending LINQ. last batch is only partly full. The method will always return the minimum number of batches needed to contain all elements, with the exception of an empty input. In that case, a sequence containing an empty sequence will be returned. While that may be desired behaviour, this is something I will change. Doing so will allow us to simplify both this and the rest of the code easier. Of course, we could always re-add the special case, if we like. In my version, the method will simply return an empty sequence for an empty input. With that out of the way, note how the number of batches will always be the length of the input, divided by the batch size, rounded up. The above is really just a minor quibble however. The real meat of this post is looking at the runtime of the presented method. Note how it enumerates the input once to determine its count, and then once more for each batch. That means that the method’s runtime is O(n + nk) with n the size of the input and k the number of batches. The latter is really a linear function of n, so the worst case performance of the method is O(n + nO(n)) or O(n2). This seems less than optimal. After all, in the end we return each item of the input only a single time – albeit differently organized. The former intuition is in fact correct. We can make the method run in linear time easily enough. All we have to do is make sure we do not enumerate the entire list, every time we Skip() the previous batches. This method now does in fact run in guaranteed linear time. Another topic to consider is whether our method should execute immediately, or defer until we actually need the result. The original method was entirely deferred – except for one thing: It determined the number of batches on its first call. That means that if the collection should change before we are done with our query, we might get unexpected results. We might miss elements that fall into additional batches, or we might get any number of empty batches in the end. Even worse, we might skip elements, or get them more than once, if elements are inserted or removed. Our improved implementation does not have these problems anymore. The result will contain exactly those elements that were in the sequence when we called the method. In that way it is executed immediately. The result of the method is deferred however. Double so in fact. Both the outer for loop, as well as the skip-take combination use yield return to defer execution. While the previous implementation is entirely adequate, I thought it would be nice to see the method implemented in an completely deferred way. That is really all we want to do. No calculations or other complications are required. The way we can implement this is by using only a single IEnumerator<T>, that we share between the logic that splits into batches, and the logic that enumerates each batch. // return batchSize items here! Note how we use the using statement to make sure the enumerator will be appropriately disposed in case of an exception. We have multiple options for implementing the loop’s body. For example, we could create a List<T> which we fill with our items, and then return and switch out with a new list, every time it reaches the maximum batch size. EDIT: Unfortunately, the implementation below is severely broken. I did not notice this until well after implementing it. Do NOT use the code below! It is in fact not possible to implement this part in a deferred fashion, and so the solution mentioned above (enumerating the batch into a list or array) has to be used. For a corrected version, see this post, which also analyses and explains the problem with the code below. Note how we call MoveNext() after yielding the first element of the batch. The reason for this is that we already called it once in our calling method, to make sure there are any elements to batch in the first place. Other than that, the method is rather straight forward. This solution is completely deferred – on both levels – and has linear runtime as well. Starting out with a quick implementation of a method to batch or page a sequence into equal parts, I hope this exploration of how to analyse and optimise a method like this has been interesting. We ended up with what I consider a rather elegant – even pretty – implementation that I hope will come in handy for some. Not quite sure that I follow the use of the function. Could you provide an example? It is a bit of a situational thing for sure. However, there are a number of ways in which the function can come in handy. An example would be for dividing a large number of items into pages, maybe you only want to show 10 items on each page. Another case might be that you may want to split up a large number of independent tasks, either to be run on different threads, or to be run one batch at a time, without blocking the UI.